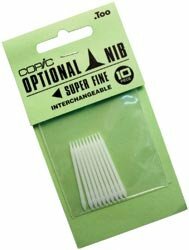 Bulk Buy: Copic Original Super Fine Nibs 10/Pkg (5-Pack) by Copic at Stickman's Blog. MPN: SPRFNN. Hurry! Limited time offer. Offer valid only while supplies last. COPIC- Original Replacement Nibs: Super Fine. This package contains ten interchangeable super fine replacement nibs for Original Copic Markers. COPIC- Original Replacement Nibs: Super Fine. This package contains ten interchangeable super fine replacement nibs for Original Copic Markers. Markers not included. Imported.